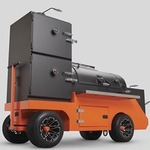 Yoder Smokers Community Forum • View topic - Smoke flavor? Hi, I'm the proud new owner of a YS640. Cooked a brisket as my first project. Did it as follows, separated the point from the flat, trimmed the excess fat, marinated both overnight. I set up my smoker for indirect at 225 and cooked them for 6 hours and then wrapped them in foil with a little baste and put them back on the grill at 300 for another 1.5 hours until they were perfectly tender. Then I rested them for a half hour before cubing the point section into burnt ends and saucing them. The flat was sliced. The flavor was great and the tenderness was perfect but I really didn't notice any smoke flavor....... What did I do wrong? I found the recipe on the sauce.attbbq.com and they used a ys640 as well. Help!! Did you think that there was no smoke flavor, or did everyone that ate it also think it had no smoke flavor? The Yoder pellet cookers only put out the cleanest of light, transparent, blue smoke, which will not impart a bitter acrid taste. If you have been used to charcoal or an offset wood cooker, where the fire can be made to be dirty (opaque, whitish smoke), then there will be an adjustment to the clean smoke. Whitish smoke contains unburned wood solids that are deposited on the food, which is what causes the excessive smoke flavor and bitterness. The other issue is that if you are the cook, in and around the cooker, you will be desensitized by the smoke, and will not be able to taste the smoke "flavor". I can never taste the smoke flavor after cooking, but I can the next day, or week, with the leftovers. My suggestion is to take a shower and change clothes while the meat rests before serving (you are letting the meat rest, right), and you may find that your taste is cleansed enough to taste the smoke "flavor". Up till now I have been using a ole hickory smoker which uses propane and wood. Maybe that's the difference. I smoked the brisket yesterday and my wife and I both tried it today and neither could really appreciate a smoke flavor. I was using a fruitwood pellet instead of hickory, which I am used to using so maybe that is part of it too. I will say the Yoder is super easy to use and I am very impressed with the quality of it unit. I think I will lower the cooking temp and lengthen the time to give more exposure to the smoke and see if that changes it. I have always smoked briskets for 12-14 hours in the past. Welcome to the group! Glad your first brisket went pretty well. As for the smoke... here is my two cents. I have cooked about 15 full packers on my 640. I am not an expert but have enough cooks under my belt to feel confident in what I am about to tell you. Herb can chime in if i am off base here. First off, the cooker is awesome and very efficient. That is why you don't get the stereotypical dirty smoke flavor. There is nothing wrong with that flavor, in fact some prefer it. However, with the Yoder pellet cookers you won't get that. 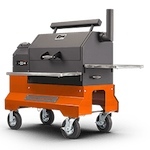 Your comment of running it lower and slower and exposing it to the smoke longer is logical, but not correct on these cookers. The "amount" of smoke that is produced and exposed to the meat is the same at all levels of cooking. Herb preaches that a lot. 1.) Use a more pungent wood pellet. Fruit woods are typically very light in flavor and compliment pork/poultry very well. Hickory or Mesquite are much more pungent with Mesquite being the strongest that I would suggest. Run a cook with one of those two woods and see what you think. The briskets I have cooked with either of those woods have come out with a nice smoke ring and a good compliment of smoke flavor. 2.) if the first option doesn't fix you up then I would suggest introducing "dirty" smoke to the meat during the first few hours of the cook. You can use an A-maze-nTube or equivalent to accomplish this. Its basically a small metal tube that you can inefficiently burn pellets of the same flavor you have in the hopper or of a different flavor. This will give you a nice white smoke that will penetrate hard on the meat. I use one when grilling burgers or smoking burgers and it works awesome. I would bet that one of the two above options will get you that smoke flavor you are looking for. Thanks for the advice! I picked up some hickory pellets and I'm gonna try that. I'll also look into the A-maze-n-tube. Hadn't heard of that product. I've never used fruit wood before and I have to wonder if that's the majority of the problem. Again, I'm amazed at how well the Yoder holds an even temperature and really loving it sofar. Like anything, there is a learning curve. I like the tube smoker as well. Lots of brands on amazon. I mix hardwood pellets and charcoal pellets together. The smoke ring is a chemical reaction that needs a little dirty burn. Hardwood alone can be too clean. Bhmbull wrote: I like the tube smoker as well. Lots of brands on amazon. I mix hardwood pellets and charcoal pellets together. The smoke ring is a chemical reaction that needs a little dirty burn. Hardwood alone can be too clean.